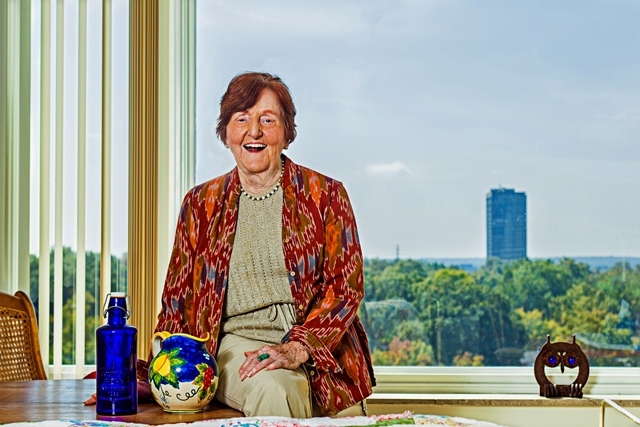 After retiring from an extraordinary career that took her all over the world, Irene Schulze, Ph.D., was still in good health and eager to be involved in the cultural activities of the St. Louis community. She now relies on the services, security, and companionship that Bethesda Barclay House, an independent retirement living community in Clayton, MO provides. “I am grateful for the care and respect that the staff at Bethesda Barclay House has given me,” she says. Born into a hard-working farm family near Washington, MO., in 1929, Dr. Schulze learned the value of perseverance and dedication at a young age. “My parents reminded me repeatedly that while their job was to operate a successful farm, which sustained the family through hard times, my job was to learn as much as I could in school,” she says. That’s just what she did. Dr. Schulze received her bachelor’s degree from Saint Louis University (SLU) in 1952. While in her undergrad, she learned how to use laboratory procedures in the diagnoses of human disease. She then assisted in teaching medical and nursing students. Dr. Schulze obtained a Ph.D. in medical microbiology and received postdoctoral training from Vanderbilt University and the Public Health Institute of the City of New York. Dr. Schulze has been honored for her achievements, thanks to all of her hard work. In 1986, she was named Saint Louis University’s Woman of the Year. She was also appointed by the National Institutes of Health to judge research projects submitted for funding. At the end of her career at the SLU School of Medicine, she worked with faculty members to update the curriculum used to teach future students. In 2014, Dr. Schulze decided to move from her home in Clayton, MO., to Bethesda Barclay House. Allowing her all of the independence of her old house, without all the upkeep, Dr. Schulze has been able to maintain her very active lifestyle. With a full calendar of planned activities and events, there is always something to do at Bethesda Barclay House. Dr. Schulze particularly enjoys the abundance of music and opportunities for socializing in the community. “I love that being here allows me to continue an active and secure lifestyle,” she says. If you or your loved one is interested in learning more about all that independent retirement living can offer to active seniors, contact Bethesda Barclay House to schedule a tour.